The Jubilee Fund provided a loan guarantee to the North End Community Renewal Corporation to purchase 510 Selkirk Avenue and convert it into Murdo Scribe Centre. The building originally was Manuel’s Furniture, but in recent years it served as a storage space. 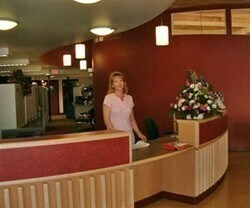 The interior of the building was totally gutted and the front exterior was substantially updated. It is now a modern office and meeting space for the Aboriginal Education Directorate who will provide training and education services to people in the North End.